Cyberspace has been hijacked by cybercriminals, cyberterrorists, cyberwarriors and cybervigilantes. But is it a real place? Sometimes artless questions like “Is cyberspace real?” turn out to reveal more than the interrogator bargained for. Not only is it real, but surreal. Eventually, any cultural theorist investigating the problems of reality alights on the work of Jacques Lacan (1901-1981), the psychoanalyst and philosopher whose controversial interpretations of Sigmund Freud now inform much cultural critique. Lacan’s interpretation of Freud is informed by structuralism and by surrealism. Surrealism influenced Lacan’s view of language but also his use of it, as he exploited puns and word games, using language to provoke, shock, and even confuse. In fact one approach I take when encountering a difficult philosophical text such as Lacan’s that stretches credibility is to treat it as I would a difficult work of art. It’s a provocation, if only I could understand what it is trying to say to me. Then I need to hold off judgement until I can work out what difference it it would make were I to believe it. I confess Lacan is still a work in progress for me, though I’m prepared to give him the benefit of the doubt. Malcolm Bowie is an authoritative commentator on Lacan and also places him in the company of the surrealists. Lacan “demonstrates his prowess in a self-conscious parade of puns, pleasantries, conceits, learned allusions and whimsical etymologies” (67). The surrealist influence also emerges in Lacan’s adoption of knotted, spatial metaphors to describe the human psyche, and his attraction to quasi scientific objects as a focus of his arguments: particularly notional and actual optical machines — long before the Internet. Lacan explicitly refers to surrealism in his book Écrits, and in another book The Four Fundamental Concepts of Psychoanalysis he refers to surrealist montage as a way of understanding psychological drives. In turn, some of the surrealists, such as Salvador Dalí, were informed by Lacan’s ideas, amongst whom he served as a physician during the early part of his career. So one of Lacan’s most interesting and vexing themes relates to concepts of reality, or to be more precise, the real. I examined some of his ideas back in the 1990s in Technoromanticism. Many people then, and now, thought of networked computer systems, game environments, and virtual reality as providing alternative realities. The term in use was cyberspace, which does imply a place, a parallel universe, something you could dip into and emerge from, as in The Matrix. Moving in and out of cyberspace resonates with the surrealist idea advanced by (surrealism’s founder) Andre Breton, “the world of dream and the real world are only one” (55). The real world dips into the surreal, “the current of the given,” to reveal differences in intensity between truth and illusion, which are inscribed in one another, “our mental equilibrium seeming obviously to hang upon this very precise distinction” (56). If cyberspace narrative wishes to add weight to its claims for the challenge, ubiquity and transforming power of cyberspace then it could do worse than identify it as a manifestation of surreality—a techno-surreality—that subsumes our everyday concepts of the real. According to Zizek, such paradoxes provide “the precise definition of the real object: a cause which in itself does not exist—which can be present only in a series of effects, but always in a distorted, displaced way” (163). One of Sigmund Freud’s explanations for everyday psychological disturbance hinges on the thwarted desire of every child to return to the safe haven of her or his mother (to summarise). We are impeded from this return by the notional authority of our fathers. Freud presents the story of this prohibition through the abiding myth of Oedipus the young man who kills his father and marries his mother, two actions prohibited in most cultures. For Lacan this circumstance is a further example of the paradoxical nature of the real, (in Žižek’s words) “the prohibition of something which is already in itself impossible” (164). So the real is apprehended as something fraught, impossible and paradoxical. Another example (not from Lacan or Zizek) would be the fraudulent position of the Wizard of Oz, in Frank Baum’s book, where people make him “do things that everybody knows cannot be done” (199), and yet the land of Oz seems to thrive off this hollow core of impotence. To this catalogue of testimonies to the ineffability of the real I would add the concept of cyberspace. There is no technology that enables brain implants linking us to a data matrix, and as phenomenology tells us, experiencing and knowing do not function that way anyway. Cyberspace is an imaginative fiction that provides a stand-in, a substitute, or a wildcard in various digital narratives — for what we are not sure. Cyberspace functions as “a pure void which functions as the object-cause of desire” in Zizek’s terms (163). This is not to privilege cyberspace as the ultimate expression of the real any more than it is to privilege the Land of Oz, but to show how the real feeds on just such absurdities. In so doing, the Lacanian real draws on early forms of the myth of unity, and aspects of the Platonic real. In Zizek’s words the real is characterized by paradox and “contradictory determinations” (171), and can only be apprehended through them. So I think I’m prepared to accord reality status to cyberspace in Lacanian terms, as metaphor, provocation and paradox. The picture above is of a facade projection on the historic judges lodgings in Lancaster England. 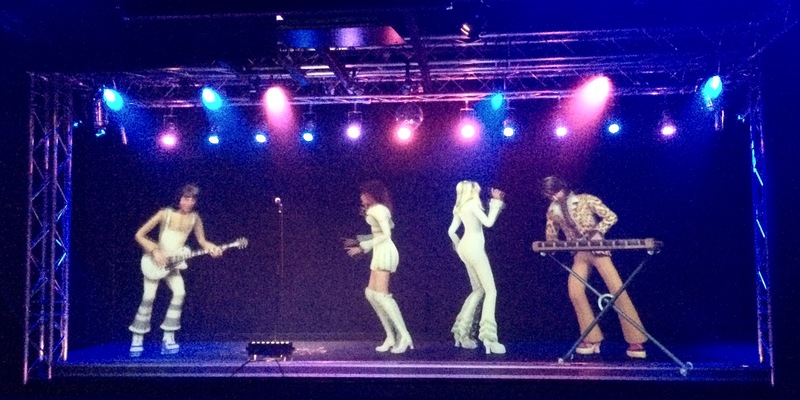 Here’s a virtual stage show in the Abba Museum, Stockholm.